Creep feeding must be carefully appraised in view of economics of cost of gain, potential market, and the influence on sale price of the calves. Photo courtesy of Troy Walz. A three year study was conducted at the Gudmundsen Sandhills Ag Lab starting with 120 crossbred (5/8 Red Angus, 3/8 Simmental) March-calving cows and were divided by body weight within age group. Treatments were creep feed with a limiter versus no creep feed. The non-creep treatment occupied one pasture while the creep treatment occupied 2 separate pastures. Creep-fed calves were introduced into the pasture containing creep feeders surrounded by panels with openings sufficient to admit calves but prevent cow entry (8 openings, ~15 inches wide). Cow Body Weight (BW) and Body Condition Score (BCS) were measured at calving, prebreeding, and weaning. Calf body weight (Calf BW) was measured at birth, prebreeding, and weaning. Results of the creep feeding and its effect on the cows and calves are in Table 1. Results from this study demonstrate that creep feeding calves increased (P < 0.01) calf body weight at weaning by 44 lbs over non-creep fed calves. Average intake of creep feed that disappeared from feeder was approximately 4.44 lbs (as fed basis) per calf per day, resulting in an increased cost of $64.80 due to creep feeding. At the time of weaning of this study in Nebraska (December 4, 2017), average steer price for 507 lbs steers were worth $209.75/cwt vs. 551 lbs. steers at $202.5/cwt. Due to the increased weaning weights and without considering costs, creep feeding resulted in an increase of $52.36 per calf in added value more than the non-creep fed calves. Selling weaned calves at this point in time, the increased calf weight due to creep feeding did not cover the expense of the creep feed. Creep feeding calves did not influence (P > 0.06) yield Grade, ribeye (longissimus) muscle area, or marbling score after a feedlot finishing period. However, steer finishing live weight, hot carcass weight, and 12th rib fat thickness were increased (P < 0.04) by pre-weaning creep feeding. Additional value of added weight for the steers at slaughter was $63.80 based on hot carcass weight. Under the conditions of this study, creep feeding calves prior to weaning was not a cost effective strategy to increase weaning weight of calves. Therefore, when considering creep feeding this summer you may want to look at the projected price of the calves and the cost of the feed before making the decision to creep feed. In addition, the cost of the feed calculated in this study does not include labor cost to deliver feed to the creep feeders. Under severe drought conditions, creep feeding can be used to offset declining forage quality and quantity due to replacing some forage consumption. However, creep feeding will not replace or decrease the calf’s milk intake. Thus, creep feeding calves in drought conditions does not result in lowered nutrient requirements for the dam and may exacerbate the loss of forage due to drought on the cowherd. Another concern with creep feeding is the long-term impacts on creep-fed heifer calves. The increased rate of gain from creep feeding in heifers can cause over-development of the udder or fatty udders, resulting in lowered lifetime milk production of replacements going into the cowherd. In a long-term study conducted at Purdue University, cows that were creep-fed as heifers weaned less pounds of calf during their lifetime production. Creep feeding must be carefully appraised in view of economics of cost of gain, potential market, and the influence on sale price of the calves. For more information on this topic NebGuide G2077 Creep Feeding Beef Calves is a good source of information. 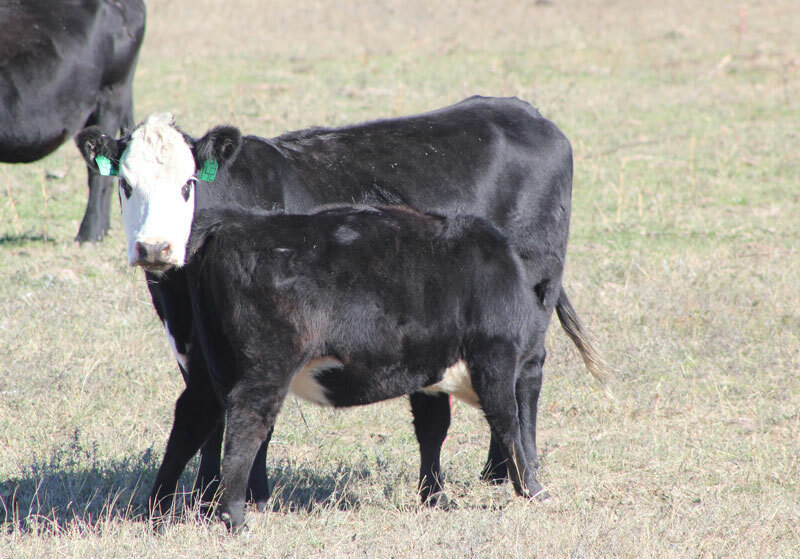 The information from this study can be found on page 18 of the 2018 Nebraska Beef Cattle Report titled Effects of Gestation Supplementation, Synchronization and Creep Feeding in a Spring Calving Beef Herd in the Nebraska Sandhills.